"Paloma" is a powerful moving girl with plenty of scope, desirable conformation and a friendly, confident attitude. Paloma's dam, Fintan's Queen (Grosvenor's Lad x. Castlegar Pet), attained Class One status with excellent marks for type. She was shown by owner, Liam Cotter, before being lightly backed and put in foal. "Queenie" was purchased by us as a foundation broodmare. In 2017 at the IDHSGB Annual Show Queenie won a strong mare class of fifteen, won the Mare of the Future class and went on to be Mare Champion. Paloma's sire, Harkaway Lionhawk by Snowford Bellman x. Roma Blue Hawk (Rakish Paddy x. Roma Blue Wind) compliments Queenie's substance with quality and athleticism. Hawk has produced Class One stock in both Ireland and the United States, marked by their true carrying power and athleticism with an emphasis on jumping and trainability. 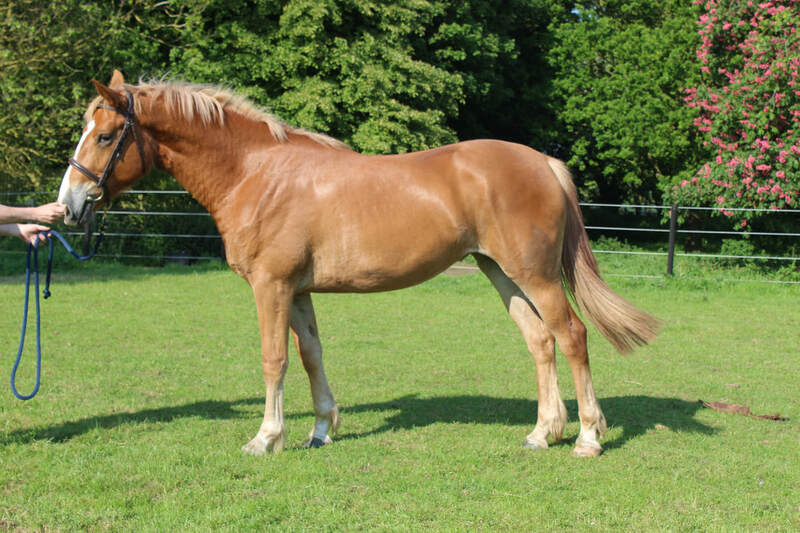 Paloma is a super moving filly who will stay chestnut and mature to 16.2hh-16.3hh. She will follow in her mother's footsteps being a riding/ competition horse as well as a fantastic broodmare. She has been responsibly handled since birth. Paloma stands for the vet and farrier, has travelled on her own and with company, to local shows and county level, she has stayed away overnight with no fretting or worry. She gets along with all of her pasture mates. She has a lovely nature and is very bold. This special filly is destined to succeed at whatever she attempts, whether her owner has ambitious or humble goals. Come meet her, mum, uncle and friends. Please enquire over the phone for more information: 07947 762114 (Sarah) or 07983 507761 (Tony).